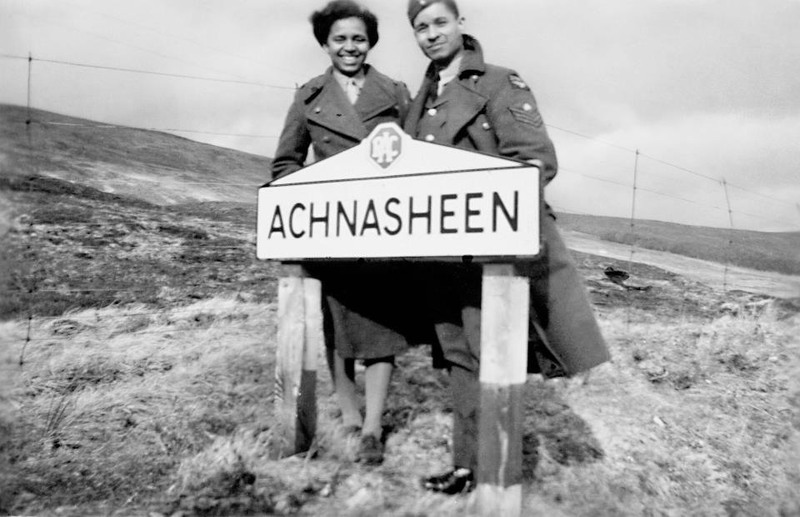 Caribbean aircrew in the RAF during WW2 » Blog Archive » BALDERAMOS – Leopold C.
Leopold (“Poli”) Balderamos, on leave, visiting his cousin, the actress, singer and songwriter Nadia Cattouse, also from Belize, (who had joined the ATS) at Achnasheen, in Scotland. Leopold Balderamos joined the RAF in 1942 and flew Stirling bombers with 196 Squadron. After the war he transferred to civil aviation and spent a considerable time with the CAA visiting many airports both in the UK and Europe before returning to Belize, where he became Chief Civil Aviation Officer. In January 1966, as Chief Commissioner of the Boy Scouts, British Honduras, he was awarded the M.B.E. in the Queen’s New Years Honours list. In January, 1966, “Leopold Clifford Balderamos, Esq, Chief Commissioner of the Boy Scouts, British Honduras” was awarded the M.B.E. by the Queen.